Wynonna has been dealing with all sorts of monsters this season like Devourers of Souls and humongous spider demons. Now, she has to deal with an evil genie-like thing called a Marzanoik! In this official sneak peek, Jeremy is helping Wynonna with the newest murder case when she gets a call from an old boyfriend who wants to take her on a date. It's sort of odd, but what isn't in Wynonna's life? But Perry has something up his sleeve and it doesn't look good! Is Perry a bad dude or just a weird one? Wynonna doesn't need any more trouble, not with Black Badge on her back. She's gotta do what she's gotta do, though and that means facing whatever horrible monsters are headed her way. Wiping out these monsters is her number one goal. Wipe out the monsters and demons, wipe out the curse. Then she and Waverly can be free. 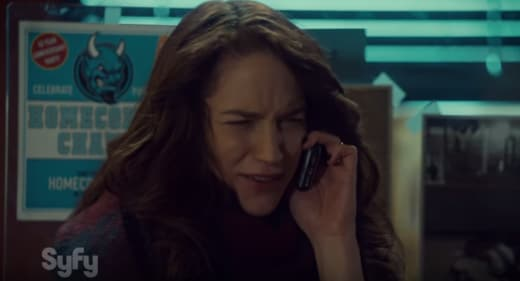 Check out the video from Wynonna Earp Season 2 Episode 3 below, and let us know your thoughts.